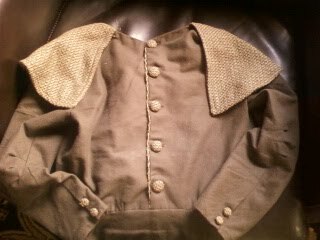 The shirt is vintage, and the only thing that I did to the sweater was to take it in a little and add vintage buttons. The fabric is the most beautiful cream knit, and was maybe the most challenging fabric that I have ever worked with. It's really heavy, but stretchy, and really ravel-y. So of course, I had to make it extra difficult by doing it without a pattern! Really, the reason that I did it was because I loved the fabric so much, but I only had bits and pieces of it. I used it to make a dress years ago, and since I no longer wanted to wear the dress (alright, I could no longer fit into the dress after having a baby! ), I decided to cut it up and make something else. It was so frustrating, and I almost gave up many times, but I'm so glad that I persevered! I love this pattern so much that I have made it twice more; pictures of those to come! Also, I want to say hello to my four new followers: Jenny, Jan (fabriquefantastique; what a great screen name! ), Kate, and Kate! Welcome! So, first I would like to welcome my newest followers; hello Garofit and Wendy! I like your blogs, too! I would also like to apologize to Hattie_vintage; somehow I missed you when you joined. Welcome, all! If you like blogs that are only updated every month or so and which feature horrible, blurry photos, then this is the blog for you! Really, I am going to try to do a better job in the future; both with the posts and with the photos! Here are some long-promised pictures of an outfit that I recently completed. Please ignore the fact that it really needs to be pressed; I caught my husband in an accommodating mood and didn't have time to iron it for the pictures! 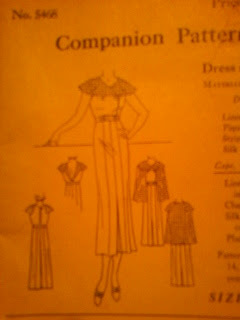 In the pattern, the dress is sleeveless; I added the sleeves in order to make it winter-worthy. The pattern also calls for the cape to be sewn onto the dress, but I wanted to make it detachable, so I added some buttonholes to the cape and sewed some buttons underneath the collar. I also changed the back. 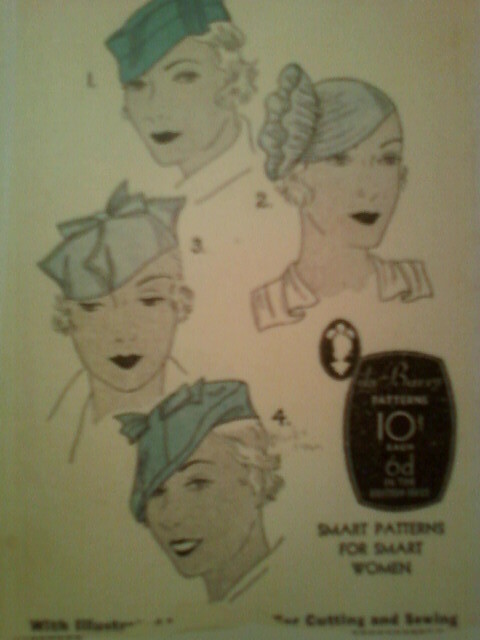 The pattern calls for the back to be open except for a clasp at the neck. Maybe as a summertime dress, which this was obviously designed to be, this would be desirable, but it doesn't seem practical to me at all; I mean, I like my undergarments, but I don't want anyone else to see them! I suppose that if the cape were sewn on according to the pattern directions, though, it wouldn't really matter what the back looked like. 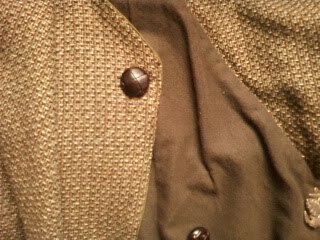 I added covered buttons all the way down. I love covered buttons, but covering them with this thick tweed was a nightmare, especially those small ones on the sleeves! This dress really makes me want to watch Gosford Park again; I would want to wear it in that scene when they all have lunch outside in the gazebo after the men go hunting! Here it is in action; we went on a hike at the park because the weather was so nice. Although there is still snow on the ground from the massive storm we had last week, it was about 55 degrees outside; perfect cape weather! I am planning to make this again as a summer dress; I have some green crepe and some awesome plaid linen all ready for when it warms up. I think that when I make it, I will just make the back all one piece and change it to fasten in the front instead. What do you think? So, "posthaste" is a relative term, right?! Hello, all; so sorry (again!) to have been away for so long. We have just completed a nightmarish ordeal which took up all of my time and energy: refinancing our house. If you haven't attempted to do something like this during the current economic downturn, don't do it! Unfortunately, we couldn't wait, as we had a short-term loan that was expiring and we were in danger of losing our home. But, it all (finally!) worked out, and with that behind me, I should be able to devote more attention to other things! 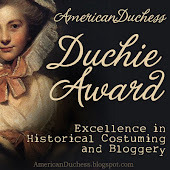 The first thing on my blog to-do list is to pass on the award that I received from Bruce of Eclectic Ephemera. Thank you again, Bruce! The rules for this award are: acknowledge the bestower, post the award on your blog (which I will do...just as soon as I figure out how! ), and then pass it on to 15 other blogs. I didn't quite make it there, so let's just say up to 15 other blogs! Next up: the outfit post that I promised over a month ago. Really; I already have the pictures taken and everything!